Show You Love Your Country! The 2019 race features the "Challenge 6K", which includes the GREEN MONSTER! If you're a CrossFitter, that would be your RX+ Course! Just select the "6K" distance when you sign up (same price as 5K, but with different awards). The Run2Remember is just one of many patriotic events organized by FollowTheFlag, a volunteer organization whose sole purpose is to give residents of Utah and America in general a place to show off their patriotism and to remember that freedom isn't free. 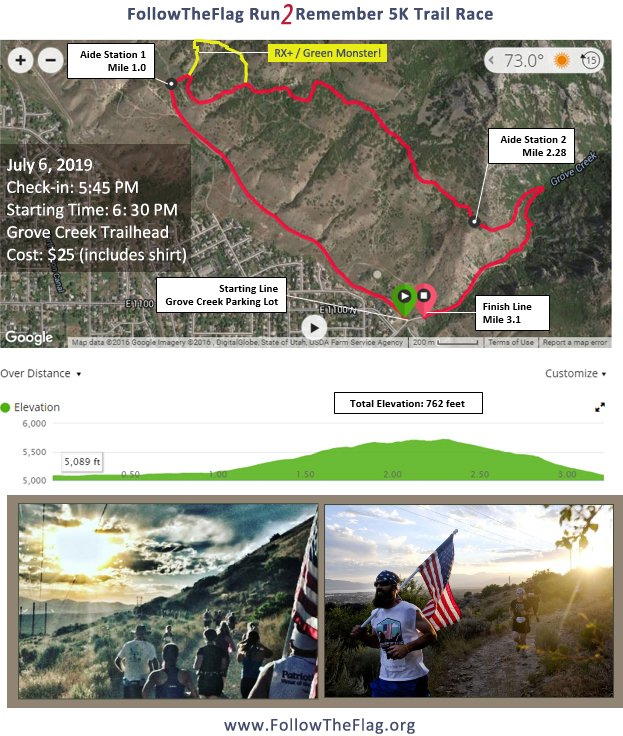 Come to beautiful Pleasant Grove, Utah and honor America's veterans by running a fun 5K trail run that finishes under the largest American flag ever made. The race consists of three sections: 1) the first mile if relatively flat and fast, 2) the second mile is an uphill climb that will raise the heart rate and thin the pack, and 3) the last mile is nothing but downhill, as you finish along the majestic Grove Creek with an epic, under-the-flag, finish line. The race starts promptly at 7:00 PM and registration closes on July 5, 2019. Register now to reserve your place and receive your complimentary Follow the Flag 2019 event T-shirt! The early bird price is $20, with the price increasing to $25 after Jan 1, 2019!